I had intended to follow-up my last blog post on “Transformation” with a blog on “Purpose.” Instead, I am taking a little ‘detour’ because of an experience last week. In some ways, it is a perfect segue from transformation to purpose. I hope you agree. Last week I sat in the middle of a number of boxes containing the ‘lives’ of my mother and father. Boxes that I moved to our home when we moved my dad in 2015. I had been through several others but realized that these last boxes would take time. They were full of scrapbooks, photos, and letters. They were an intimate part of my parent’s lives. It is almost a year since dad passed. It isn’t that I dreaded going through these boxes, it was more a function of schedule and time. The first box I opened had many photos that are destined for my niece and my brother’s side of the family. I smiled, a lot, as I looked at pictures of mom and dad, my brother and dozens of pictures of his young family. I also found a handful of my daughter. It was fun, nostalgic. The last picture I found was a picture of mom and dad, holding hands across the table, looking quite happy at the LeMont restaurant on Mt. Washington in Pittsburgh. They were celebrating their 36th wedding anniversary. It was September 4, 1979. They would celebrate one more, as mom had pancreatic cancer, and would pass October 3, 1980. She was 59. That picture gave me pause. I reflected on the life they had built together, and with my brother and me. I thought about what their generation lived through, the love they shared with each other, and with us. Little did I know that this glimpse of the past was just the beginning. The second box was quite a bit older. I wondered if it had been opened since we moved to our final Pittsburgh residence in 1964. I found several of my dad’s health record as he was growing up, and some grade cards. I found pictures of my dad, his brother and sister as children, and their father, who I never knew. The genetics that I share is unmistakable. I was intrigued by an old green scrap book, so I opened it. It was a ‘diary’ of my mother’s senior year at Penn State in 1942. She and my father were engaged at this point. It was full of mementos of the year. Some of the mementos were missing, and the only thing left was what mom wrote. One such item was a program for the circus they attended. Mom’s inscription was, “Enjoyed the circus, but enjoyed being with Bob more.” There were programs from various events, including the programs from their commencement weekend, various sorority and school functions, and birthday cards (mom turned 21 that year). I closed my eyes and imagined what that final year might have been like for them. Even though the world was at war, and I know that occupied a lot of my dad’s thinking, the mementos were ‘normal’ college things, while dating the person you were engaged to. I found several letters from dad from the summer after their graduation. Dad was pursuing his master’s degree in chemical engineering (they wouldn’t accept him in the armed forces because of high blood pressure) Mom pursued work in her chosen field of home economics. Their letters reflected their personalities. My father, the kind, gentle introvert; my mother, the boisterous, passionate extrovert. Mom’s words reflected her deep love for the man of her dreams, while dad’s words reflected a deep love more ‘quietly’ spoken. I stopped. I smiled realizing what a rare gift this was. I was having the opportunity to see my parents before they were parents. This was the generation that wrote letters and saved ‘mementos’ of their lives. I came along 76 years later to uncover the more intimate and ‘granular’ events in their lives; to see a picture of them that revealed so much about who they were and what they cared about. I smiled a lot and cried some, missing them. Mostly, I had a great deal of gratitude for who they were, separately and together, and what they gave of who they were to my brother and me. 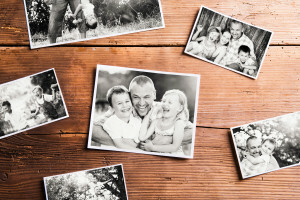 I realize that my ‘nostalgia’ over my family’s past has little direct connection for you, except in this way – we all have our ‘stories’ and ‘our people.’ They are part of the road map of how we became who we were and influence who we are becoming. This heritage is worth understanding, for all its greatness, and for all its ‘warts.’ Perhaps, understanding our heritage will help us connect to our own transformation and journey toward our purpose.